My typical breakfast consists of whole grain cereal, berries, and skim milk. However, every once in a while I like to indulge (by every once in a while, I mean every Sunday morning). Fluffy and crispy maple syrup soaked pancakes are my idea of a good Sunday morning breakfast (especially when a side of bacon is involved). This recipe is out of this world for those Sunday mornings. Small bursts of warm blueberries explode upon biting into these pancakes, giving them an incredibly fresh and light feel. I am often tricked into thinking I am being “healthy” when fruit is incorporated into a dish, so I like to add plenty of blueberries. If you are not a blueberry lover, substitute raspberries, or just leave them out of the recipe all together. I like my pancake batter a bit on the runny side. If you like a thicker batter, use less skim milk in this recipe. Add the ingredients for this recipe to your weekend grocery shopping list and make a batch next Sunday. I promise, you and your family will not be disappointed. I hope you enjoy them as much as we did. Combine skim milk, eggs, vegetable oil, banana, vanilla extract ,and Greek yogurt, mix well. Combine the wet ingredients into multigrain pancake mix and stir gently, just enough to moisten the dry ingredients. Let rest 15 minutes. (Note: Don’t worry about lumps, it is better not to over-mix the batter. 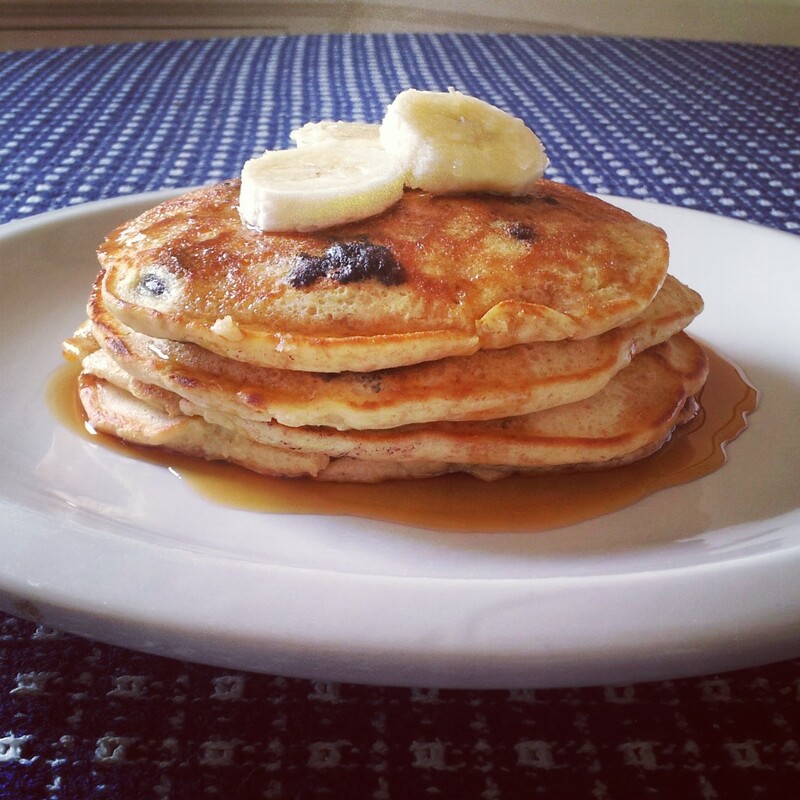 The more you mix the the batter, the tougher the gluten in the flour becomes which leads to a very dense pancake). Pre-heat your griddle or non stick skillet to 375 degrees F (medium high). Lightly coat hot pan with vegetable oil or non stick cooking spray. Ladle 1/4 cup of batter onto your cooking surface. Fit as many ladles onto your cooking surface without overcrowding the pan, leaving room to flip them comfortably. Add blueberries to the pancakes (6-8 per cake). You do not need to push the blueberries into the batter as the batter will cook around them. The pancake is ready to flip when small bubbles begin to form in the center of the pancake and the edges begin to dry up. Sometimes I peek at the bottom of the pancake to make sure it is golden brown as well. When it is time, flip pancakes. Let pancakes cook for 2 additional minutes. Serve immediately with warm maple syrup and banana slices. Serve with crispy bacon for the perfect salty sweet combination. If you are unable to serve the pancakes right away, place in a single layer on a baking sheet in a 200 degree F oven.